It’s started already at Glen O’Dee but if you didn’t manage to make it to that event then don’t worry, plenty more over the year. If you enter any of these events you will automatically be included in the (JD)2C rankings so all you need do is get out there. Good luck everyone! The (JD)2C competition will be run over 9 events with the best 5 scores counting for each runner. Every effort will be made to provide a White course at each event. However, if this is not possible, the JDC organisers will review how many events will qualify for the M8 and W8 classes. If you are being shadowed or running in a pair, please declare this when you register. You will score half points for your run. appropriate to their ability. More difficult courses earn higher points. Good luck to all Scots at this weekend’s JK and “Not the JK”! Everyone at the SOA would like to wish good luck to all the Scottish orienteers making the long trip south […] The post Good luck to all Scots at this weekend’s JK and “Not the JK”! 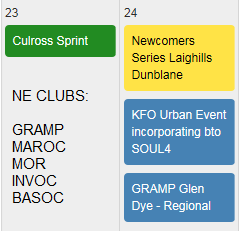 appeared first on Scottish Orienteering Association. Many thanks to everyone who spared time to respond to the survey on the inaugural Scottish Middle Distance Championships. We […] The post What YOU thought of the Scottish Middle Distance Championships appeared first on Scottish Orienteering Association.